Alternative title: Another ode to my Fitbit. 15 days ago I had minor surgery. It wasn't particularly exciting to be honest. I was apprehensive (my first general anaesthetic), but it went very smoothly and I was home the same day. 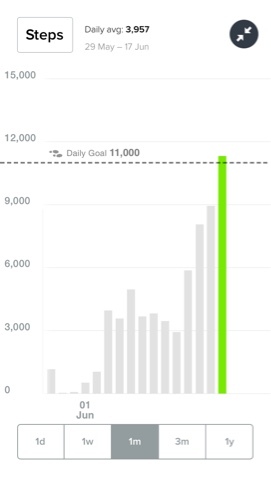 My Fitbit One has automatically charted my recovery, which I think is really cool. I wasn't quite so excited when on the first day I shuffled out of the house for a very slow walk (about 200m! ), only to discover that the Fitbit didn't count my robotic limping as walking! I ended that day with 23 official steps. I quickly realised that this was actually a good thing - the aim was to walk normally, and that's what my Fitbit measures. If I got tired or sore and slowed to a moonwalking shuffle, then it didn't count my steps because they weren't really steps. The first day you can see was the day of the op. Then I had a few days of barely anything, until the 3000 step mark. This was followed by quite a few days of three to four thousand steps, where I was able to get out of the house for a short trip. The first of those expeditions completely wiped me out - I had a 2 hr nap that afternoon! I hope you continue to feel better and get stronger! Thanks Elle. It's turning out to be a less linear/more up-down-up-down process than I had imagined. But still on the right track!